One of the things that make of San Juan Islands such a charming place is that special charisma, an unique personality that can be only found in the heart of the Puget Sound in the bay area of Seattle, in the northwestern region of the US state of Washington, surrounded by the straits of Juan de Fuca, Haro, Rosario and the Strait of Georgia, originating the group of archipelagos known as San Juan County. The west coast of the United States has been the originator of life concepts like laid back, calm pace, no rush, enjoy the life, and at the same time, this area of Seattle is very well known in the US for bringing avant-garde concepts into technology, gastronomy, lifestyle, and into many other ways of life, creating San Juan Islands’ philosophy to advocate for life and to embrace the symbiosis between men and earth. Traveling around the San Juan Islands by ferryis, by a long way, one of the best options to enjoy the natural beauty of the archipelagos in the bay area but it could be also kind of inconvenient because ferries are also the only transportation options for commuters working around the bay area. The main ferry line starts in the Anacortes peninsula, in the US state of Washington, and goes all the way to the Canadian city of Sidney, in the state of British Columbia, stopping in the different islands of San Juan County making possible the communication between people and businesses from both countries. Air transportation is also very important in this area of the San Juan Islands and the county has developed a number of airports and airparks for all kind of airplanes like charters, seaplanes or private jets that can choose between landing at Stuart Island Airpark, Friday Harbor Airport, Roche Harbor Airport, Blakely Island Airport, Burden Field-(Rabbit Run) Airport, Friday West, Roche Harbor Airport, Lopez Island Airport, Orcas Island Airport, Windsock Airport, Center Island Airport or at Decatur Shores Airport. The airports and ports situated in the peninsula of Anacortes are other great options as well because of the number of connections with the islands, something that many tourists and visitors choose, so they can go later with the most popular of the options inside the islands: bicycle, scooter or moped rentals; hiking, car rentals or the resorts’ pick-ups are the other great options to move in the islands. The islands, not surprisingly, have a number of ports, harbors and yachting marinas where sailors can tie up their ships. The islands have developed as well a number of infrastructures to boost the tourism and now offer a large variety of resorts like hotels, hostels, pensions, motels, rooms, bed& breakfast and campgrounds. San Juan is the most important island due to its population, economy and industry and holds the government of the islands. The San Juan National Historical Park holds every year the commemoration of the “Pig War” with several events with locals in period dress. Orcas Island does not have as much population as San Juan Island but it holds one of the biggest towns in San Juan County, Eastsound, and it is bigger. 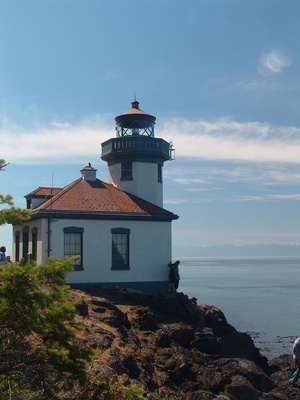 The village of Eastsound is the main town in the island but there is also a few other interesting places like Deer Harbor, West Sound, Olga and, of course, the main attraction, Moran State Park in Mount Constitution. 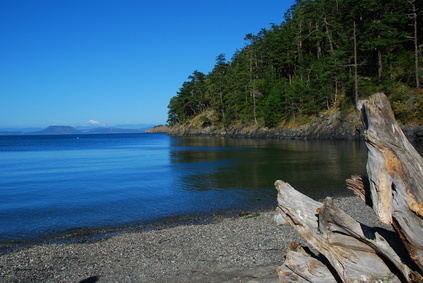 Lopez Island is the first stop for the ferry connections coming from the peninsula of Anacortes. It is more oriented for the beaches lovers who want to enjoy flat shores and rides on bikes. Shaw Island is one of the smallest islands and still has the original charming of the islands because it has not been developed for the hospitality and tourism industry. The island though has a good connection by ferry with the islands’ seaports. Copyright © SanJuanGuide.com - All Rights Reserved.